Ever since the boyfriend and I got together nearly four years ago, I’ve developed a sort of fascination with Pittsburgh, Pennsylvania. His family is originally from there and the stories I have heard of their childhood, the food, and the local accents were intriguing. Perhaps it’s because Pittsburgh is a very proud town, and its natives often show their pride no matter where they end up. Take for example, fans of the NFL football team the Pittsburgh Steelers. We have tons of Steelers fans here in Los Angeles– partially because we don’t have our own NFL team, but also because there are many transplants from the region that have taken their love of the black and yellow over to the west coast. Enter Steel City Sandwich. This Pittsburgh food truck first rolled onto the L.A food truck scene less than a year ago and has captured the hearts (and arteries) of many homesick Pennsylvanians and newly recruited Pitt lovers like myself. Spearheaded by Taylor Funkhouser and her boyfriend Neil Shuman, this truck makes Primanti’s style sandwiches that will be sure to leave you in a food coma. Their selection of sandwiches can please anyone from a meat-lover to even vegetarians. Piled high with sweet cole slaw, meat, cheese, fries, and a fried egg, our turkey and pastrami Yinzers hit the spot. Add decadent Jenny Craig Fries (w/ carmelized onions, bacon, cheese, and homemade aioli), loaded Pierogies, and Grandma Style Utz potato chips cooked in lard, and you’ve got yourself quite a spread (and one hell of a carb overload). Boyfriend was so excited when we dove into our indulgent dinner and Taylor was an awesome host; chatting us up about the truck, their vision,and agreeing that I must have been from Pittsburgh in one of my past lives because I was just as excited as boyfriend when I saw those fries inside my gigantic sandwich. Looking forward to going to Pittsburgh next month when boyfriend’s cousin gets married. 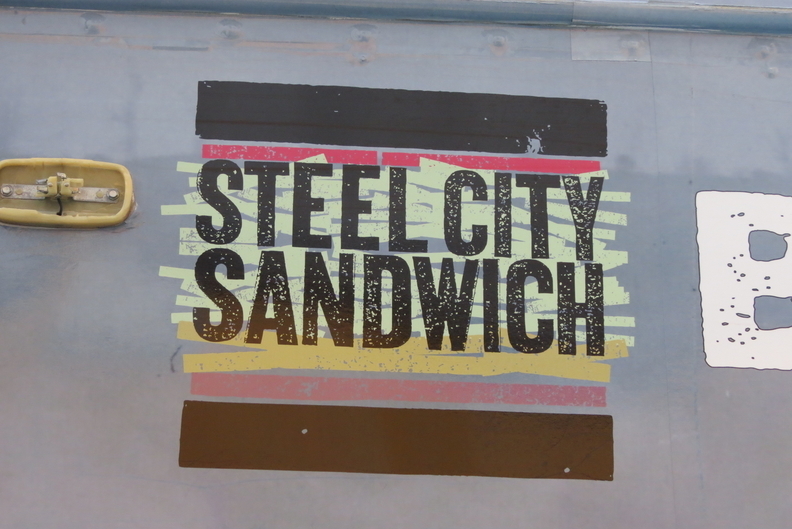 In the meantime, we’ve got Steel City Sandwich.